UNITED NATIONS, October 18 -- With the UN's Human Rights (Third) Committee considering a proposal introduced by Thailand which would reign in Special Rapporteurs and Representatives under charges of double standards, UN Torture expert Juan E. Mendez on Tuesday notably took sides. Mendez was asked, by Inner City Press, about charges that Libya's Transitional National Council is engaging in torture. Mendez replied that while he had -- rightly -- called on Gaddafi's forces not to torture, since Gaddafi's fall he has "not received any complaint that I could act upon, even though we did early on when Gaddafi very much in charge call on his forces" call for compliance, since then "I haven't received any complaint." But the charges against the TNC are made by, among others, Amnesty International. Does AI not file its complaints with Mendez? Or in Mendez unable to read the newspapers and begin an inquiry? Who complained to him about Gaddafi, leading to his public call? Likewise, while Mendez was blocked from visits complying with international law with Bradley Manning, charged with providing information to Wikileaks, Mendez on Tuesday said he has had "productive communications" with the US. 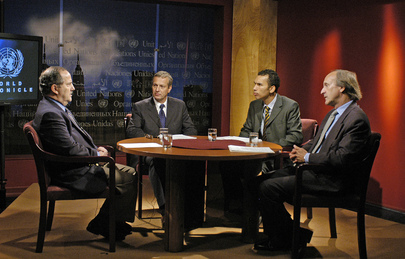 Long-time UN official Mendez, whose jobs have included advising on the prevention of genocide, also seemed to go soft on the UN of Ban Ki-moon when Inner City Press asked him about the widespread criticism of Ban and his top lawyer Patricia O'Brien for failing to stand up for the independence of the UN funded Extraordinary Chambers in the Courts of Cambodia. Mendez said, "I have read about some concerns [about] the role of UN [but] nothing that I have read falls under my mandate as special rapporteur on torture." Well, the cases being blocked concern not only genocide but also torture under the Khmer Rouge. So will no one in the UN system be willing to speak about errors in Ban's handling of Han Sun and the ECCC? Patricia O'Brien, who has refused to answer any questions from the press because, Ban's spokesman has said, as chief counsel it would hurt her work, has now written a defensive letter to the editor of the New York Times. One way communication is apparently okay: just not any questions. So it goes in today's UN.